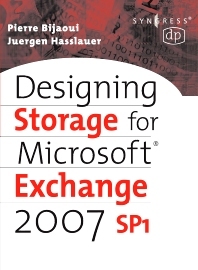 Designing Storage for Exchange 2007 SP1 will help you understand the new choices and possibilities available in designing your storage environment for Microsoft Exchange Server 2007 SP1. The move of Microsoft Exchange Server from a 32-bit application to the 64-bit world reduced the I/O footprint on the storage subsystem. This allows users to consider shared storage deployments or go the opposite way and focus on direct attached storage. Supporting large mailboxes is now possible, but how do you back up and recover the increased amount of data? Exchange Server 2007 Continuous Replication and new features in Windows Server 2008 Failover Clustering provides interesting possibilities for geographically dispersed deployments. This book explains these new built-in features of Exchange Server 2007 and compares them with application independent data replication solutions provided by high-end storage subsystems. It is critical to understand these key technologies to make the right decision which storage solution best fits your business needs. The authors share their experience from large scale deployments and depict configurations used during their projects. Pierre Bijaoui is a Solution Architect for HP Services, based in Sophia Antipolis, France. He is often involved with large customer deployments, dealing with data center and storage architectures and technologies and Windows performance tuning and optimization. Pierre has been a tutor of the unanimously acclaimed Exchange Academy program at HP since its inception and was specialized in mobility, server and storage design and performance aspects of Microsoft Exchange. Pierre is a Microsoft Certified Architect (Infrastructure). In December 2001, he published a book, Scaling Microsoft Exchange 2000: Create and Optimize High-Performance Exchange Messaging Systems, (Digital Press), updated in November 2006 for Exchange 2003 SP2. Juergen Hasslauer is a Solution Architect for HP Consulting and Integration based in Germany. He supports customers to help them define the architecture of their IT solutions. His current focus is designing highly available Microsoft Exchange environments and infrastructure optimization using virtualization solutions. Juergen is a frequent speaker at industry conferences such as Microsoft Exchange Connections.